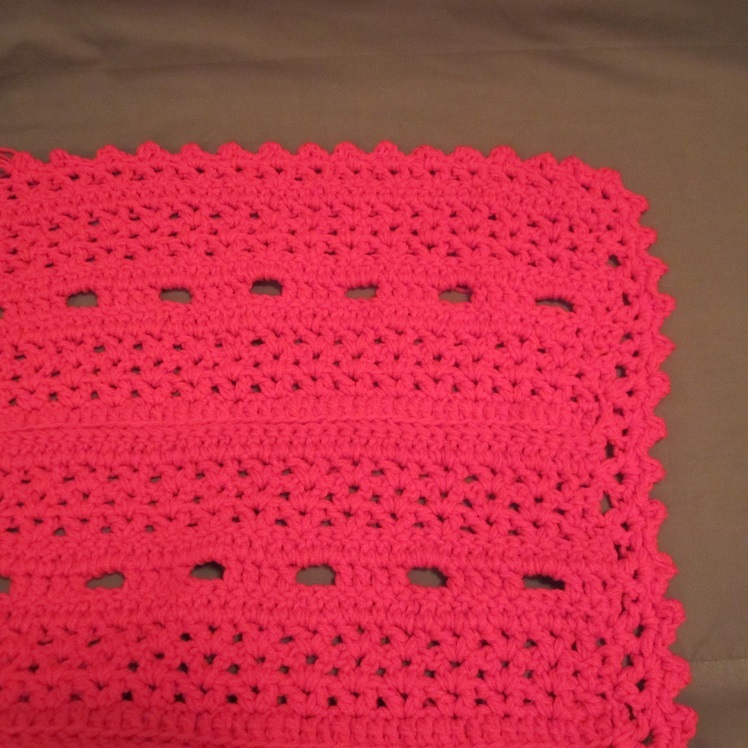 I used 2 Strands of Red Heart Super Saver Yarn held together and a size N (9.00MM) hook. 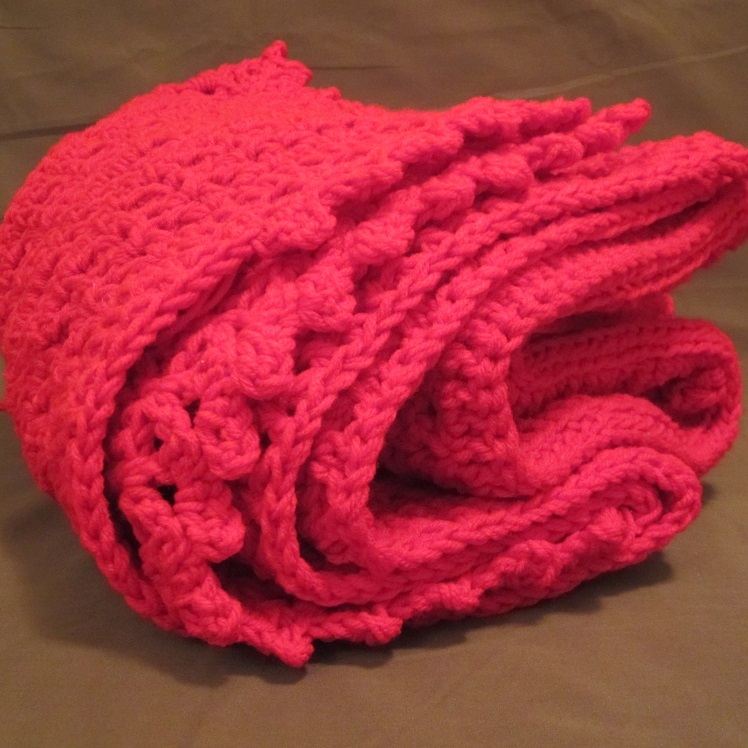 Note: Chunky yarn can be really expensive, but I luvz the instant gratification and the cozy warmth that comes with chunky projects, so I often times use 2 strands of Red Heart Super Saver Yarn. 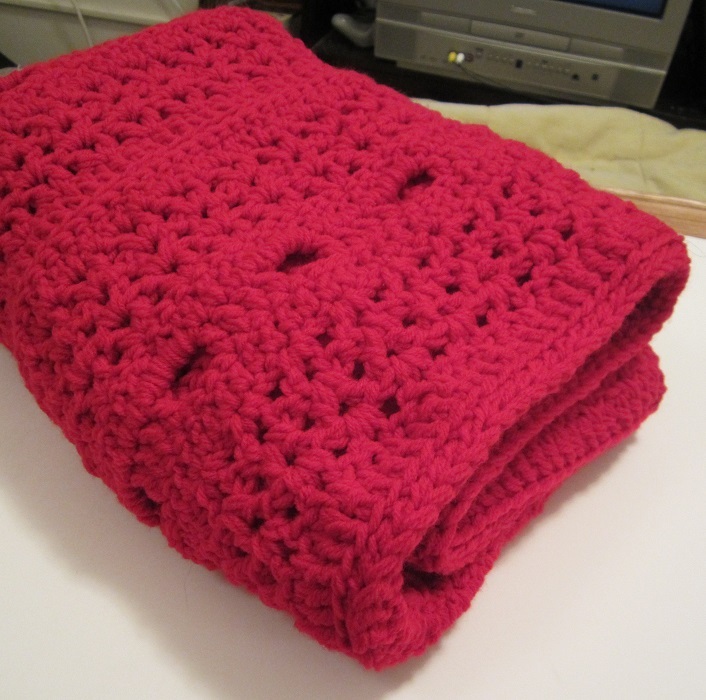 This blanket took me about 2 skeins per 2 strips…so about a skein per strip. It was difficult to tell at first since I use two skeins at the same time. Another reason I worked in strips instead of working straight up the blanket is because I hate it when I’m off on my prediction of how much yarn I’m going to need, and then I finish 1/2 or 3/4 a project and then the store suddenly doesn’t carry that color anymore. This way I can sew the strips together later, so if I wind up picking a complimentary color instead of working right through, I only wind up remaking one or two strips if any at all. I also join the strips later because I love the textured effect of using the back loops only when I join them. V-stitch: (Dc, ch 1, dc) into space indicated. Rws 3-4: Ch 3, turn. Skip first dc, dc in next dc, sk next dc, v-st in next ch-1 space. *Sk next 2dc, v-st in next ch-1 space. *Repeat from * to last 3 sts. Sk next dc, dc in next dc, dc in top of ch-3. Rw 5: Ch 3, turn. Sk first dc, dc in next 2 dc. *Dc in next ch-1 space, dc in next 2 dc. Repeat from * to last st. Dc in top of ch-3. Rw 6 ( Center Slash Row): Ch 2, turn. Dc in next 2 st. (Ch 3, sk next 3 st, dc in next 4 st) across to last three stitches, sk next dc, dc in next st and dc in the top of the ch-3. Rw 7: Ch 2, turn. Dc across working 3 dc in each ch-3 space. Rw 8-11: Repeat Rws 2-5. Fasten off after Row 11. Rnd 1: Jn with a sl st somewhere along the top. (Ch 4, dc) in same st. (Skip next 2 stitches, V-stitch) around. In each corner, work (V-st, ch 1, V-st). Along the sides where the stitch placement is not clear, you can use your best judgement. 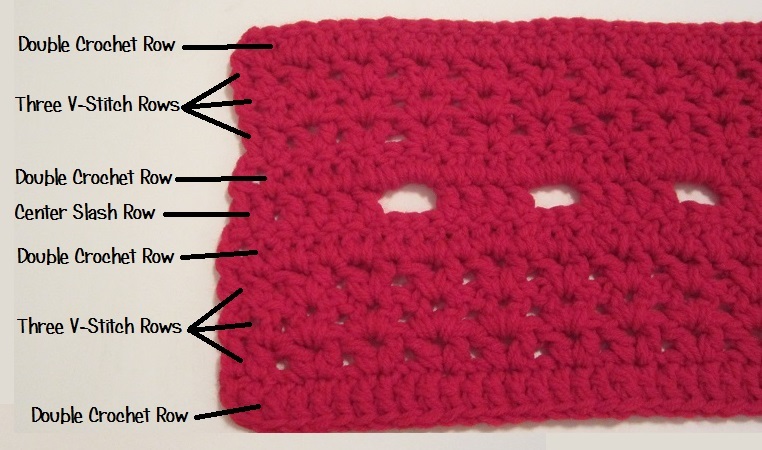 I count each row as the equivilant of 2 stitches, and this gives me about 7 V-stitches per each strip along the sides. 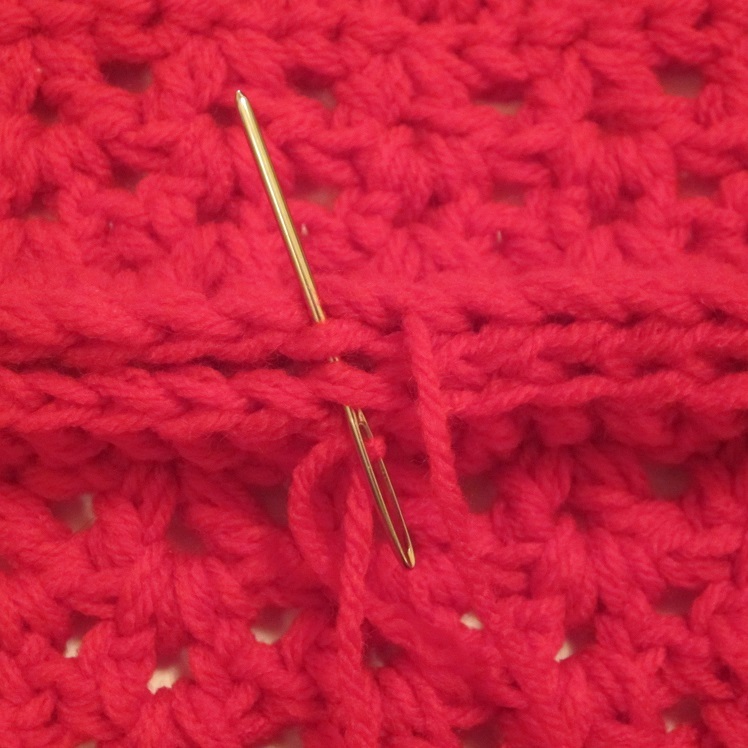 Rnd 2: In each ch-1 of the V-stitches, (sc, sc, ch 2, sc in 2nd ch from hook, sc). Jn with a sl st in first sc. I like joining the strips by putting the wrong sides against one another and joining them with a yarn needle using the back loops only. This is how I get the pleasant textured look between the strips. 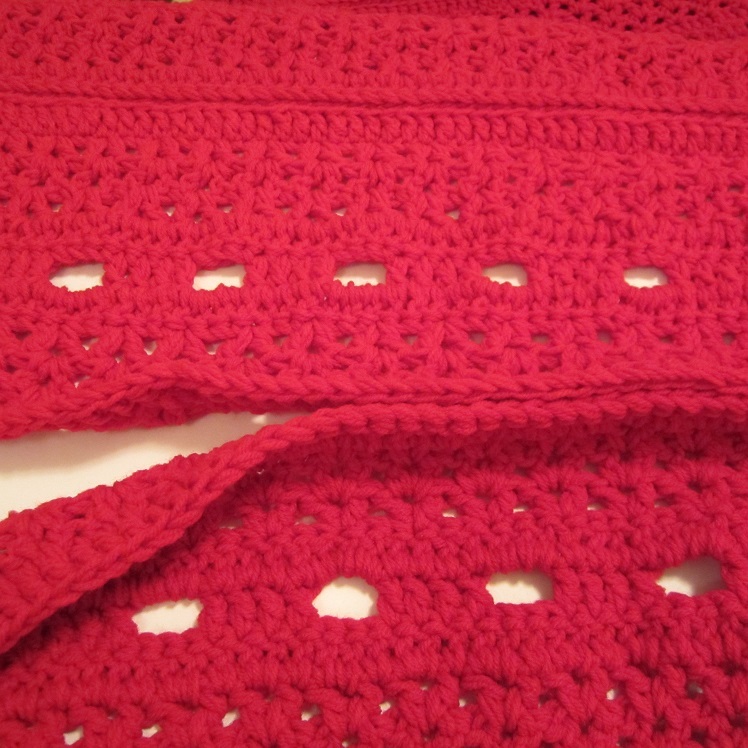 Make sure you pick one side to be the front of your blanket so that you remember to position the strips the same so that you have the textured areas all on the same side that is facing up. 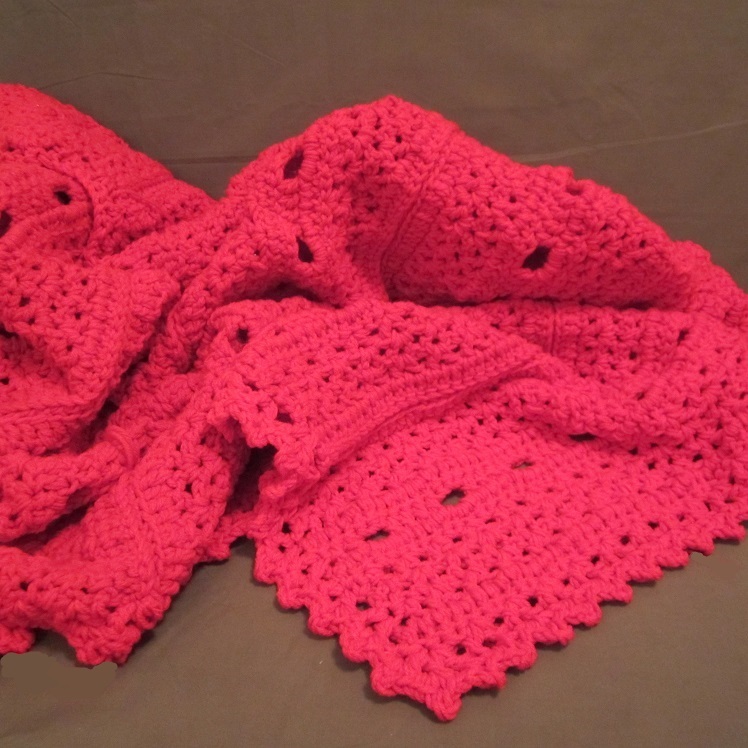 This entry was posted in Uncategorized and tagged 2 strands, afghan, blanket, Chunk, chunky, cozy, Craftyghoul, crochet, dash, dashes, free, Free Pattern, how to, lace, Love, opposites, pattern, slashes, Starling, thorns, throw, two strands, v, v stitch, war. Bookmark the permalink.